The hot hatch market is currently pretty healthy, with brilliant models like the Renaultsport Megane 265, Ford Focus ST and Golf GTI Golf GTI to choose from. 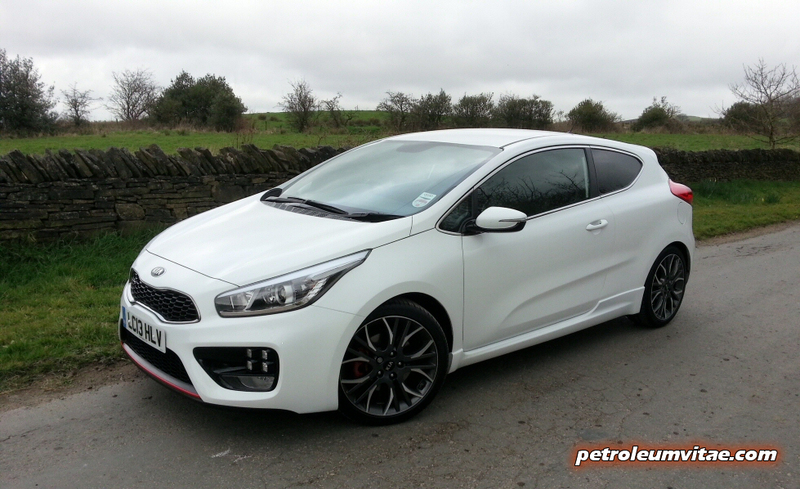 Compared to the Megane’s 265 horses, the Focus ST’s 250 and the lesser (it’s also available with 300bhp) Golf GTI’s 220, the Kia pro_cee’d GT looks a bit pants on paper, with 201bhp. It’s Korea’s first proper attempt at making a go of the sporty hatchback market and one thing immediately in its favour, though, is the price, starting at £19,995 – compared to the Focus ST which is priced from £22,000, and the Golf and Megane which are both priced from a few quid either side of £26,000. 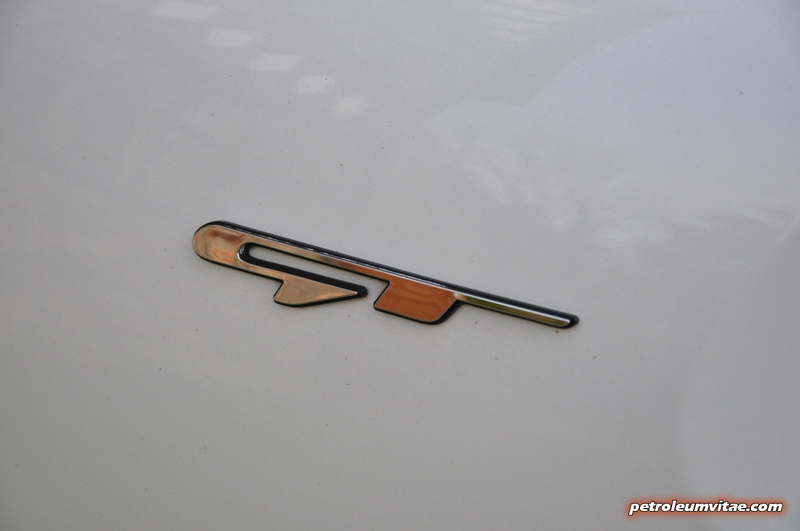 No matter what Mr. Osborne says, we still live in strained economic times, and just as some people would never tuck into a madras perceiving it as too fiery, some folk out there would shy away from the aforementioned hot hatch offerings, leaving them with little else. 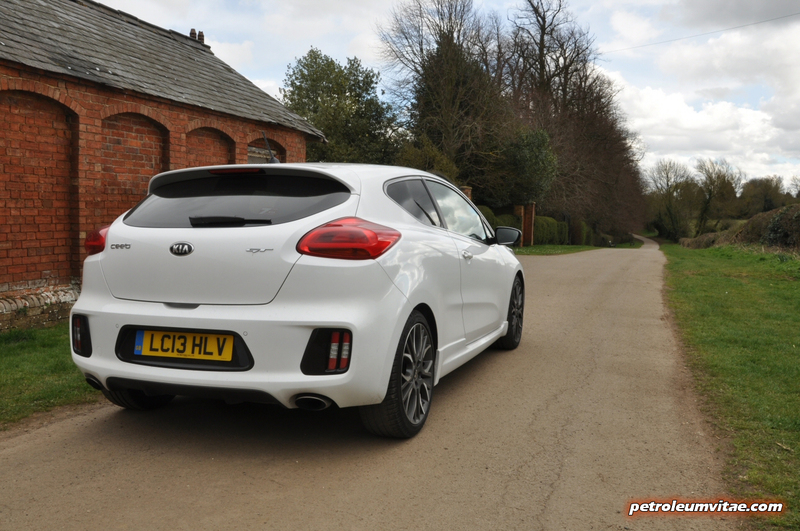 So does the Kia fill the ‘warm hatch’ gap, rather like the rogan josh (my favourite, if anyone’s offering…) equivalent in curry terms? Styling-wise, I’m not being funny, but hatches, whether they’re stone cold, warm, or hot, all look much of a muchness. Line up silhouettes of the Focus, Golf, Megane and others like the Astra VXR, and they all follow the same general gist when it comes to design. I’m sure you’ll all agree that they still all ooze appeal in their subtly different ways, though. The Kia pro_cee’d GT, tested in 3-door guise but also available as a 5-door, certainly doesn’t look out of place next to these established icons. 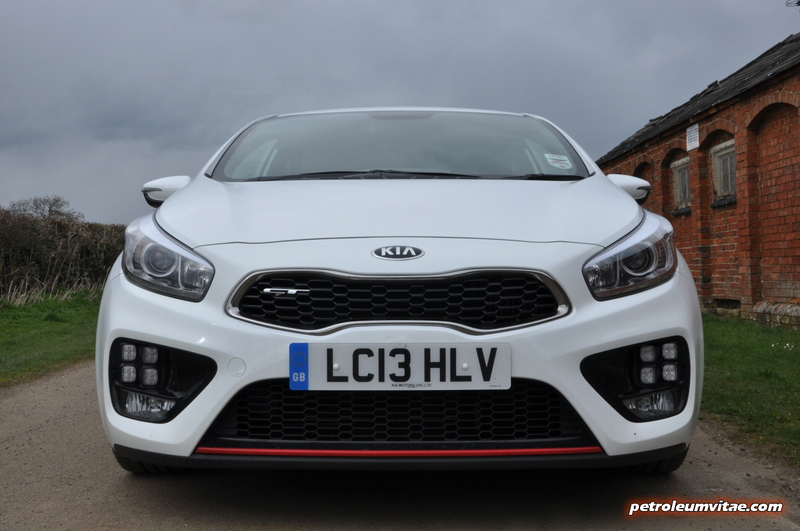 The front particularly draws attention, with its classy quad LEDs (Kia call them ice cubes) on either side of the red grille stripe, its low-slung stance, snarly expression, red callipers and classy, arch-filling alloys. 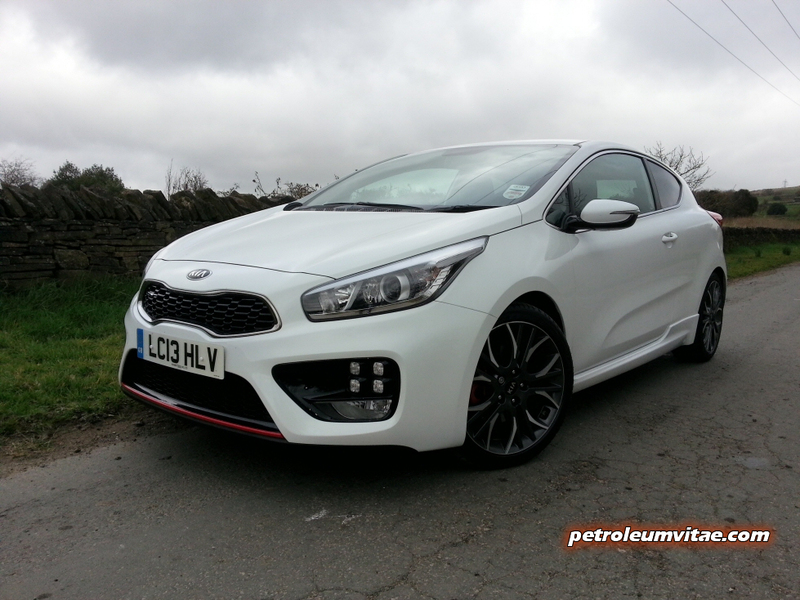 Throughout the 500-ish miles I covered during my week with the pro_cee’d GT, incidental market research certainly vouched for the Kia’s visual appeal, with oodles of passing motorists and their passengers straining their neck muscles to get as long a glimpse of it as possible. 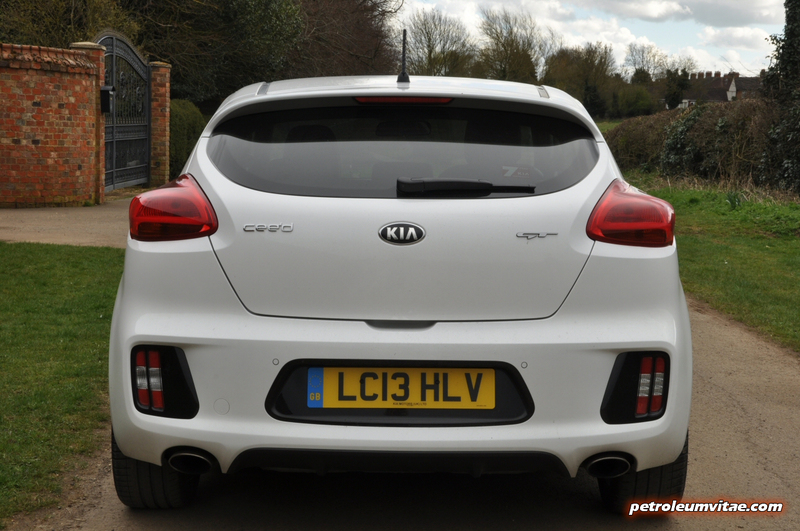 The twin exhausts and rear diffuser likely whetted the appetites of cars coming up from behind, and the GT isn’t yet a common sight on the UK roads anyway. 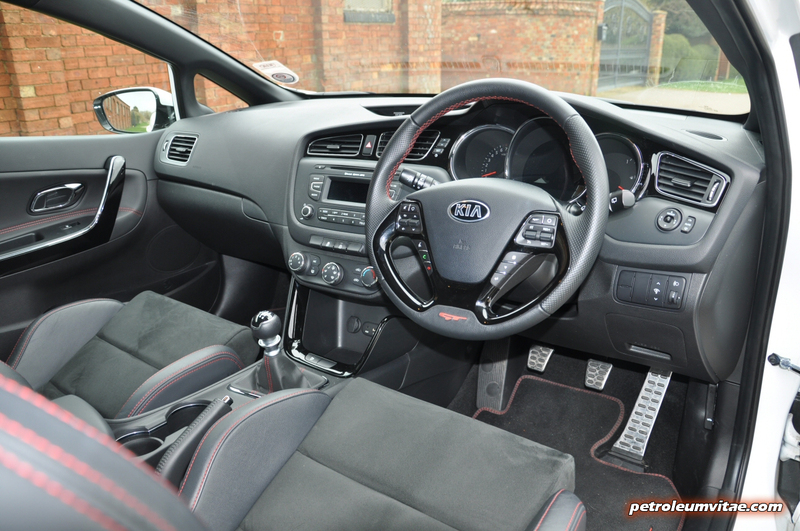 Kia will be glad to know that the prolonged stares of admiration came from a wide spectrum of society, from chavs youths in their souped-up Novas to mature drivers who would consider the GT’s price point to be loose change. 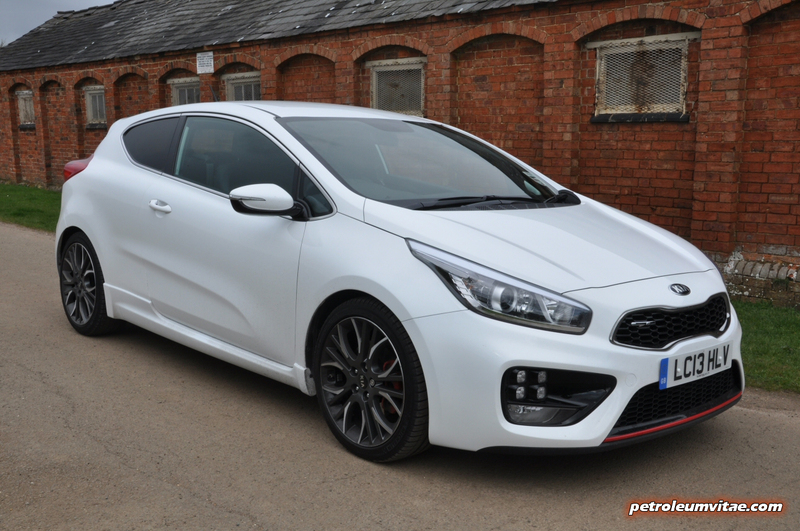 Design-wise, then, the Korean hatch gets my thumbs-up – and everyone else’s. 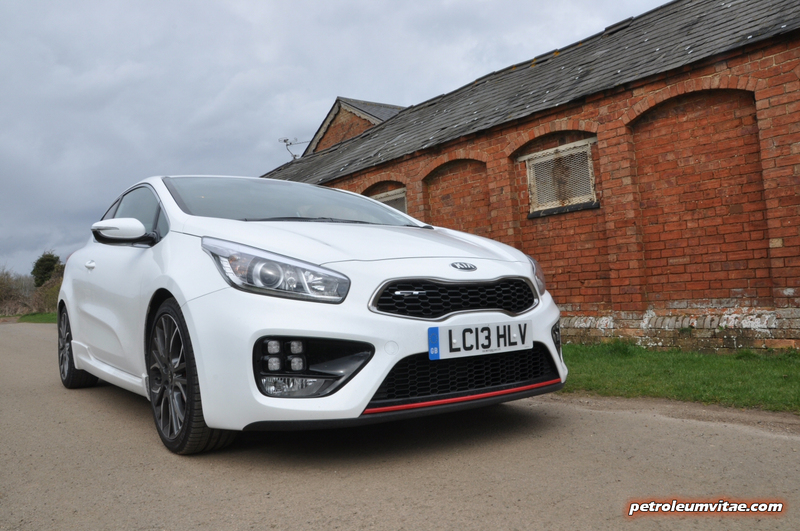 Having tested most of the Kia model range over the last couple of years, I knew what to expect – and I wasn’t disappointed. 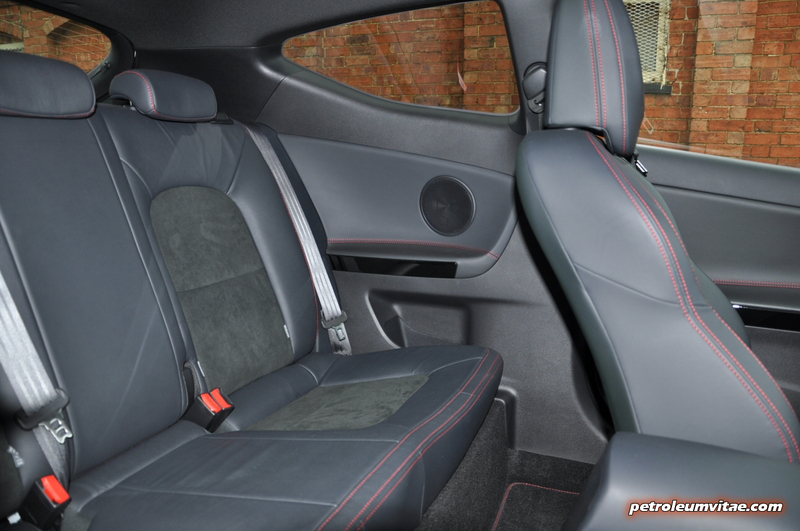 Okay, it’s not like the Megane RS 265 which has red seatbelts and fillets of carbon fibre all over the place, but the Kia’s black, conservative interior is built to last and the Recaro bucket seats with embossed GT logos set the theme. All the controls are large enough for you to get to grips with operating them during spirited driving, unlike the Focus and other Ford interiors with their myriad of tiny, fiddly buttons. 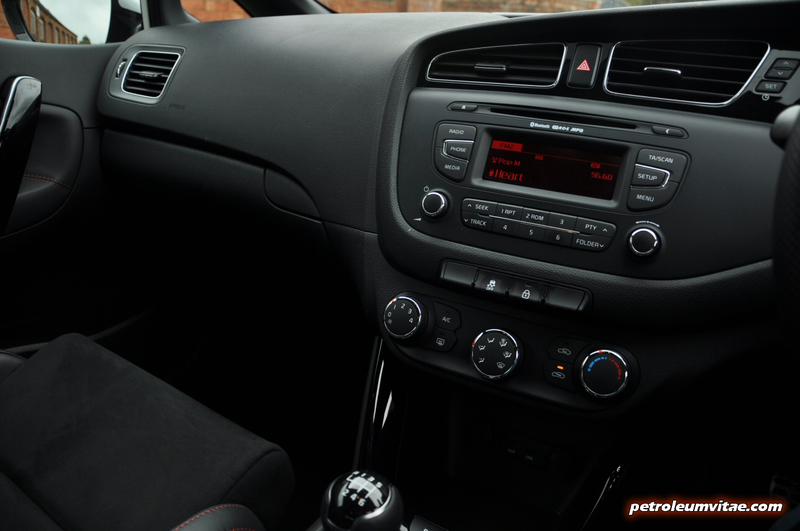 I did feel a bit naked without sat nav in this ‘GT’ (as opposed to ‘GT Tech’) spec car, but that probably says more about me than the pro_cee’d GT, and a reversing camera plus DAB digital radio would have been nice to give it an entirely modern edge. Sporty hatchbacks are primarily about the driving experience, so once I’d adjusted my seat manually, stashed my gubbins in the cheap-feeling door bins and turned the conventional key, I was happy and instantly took to the GT’s lovely gear-change action, the feel of the clutch and ‘go’ pedal, the nicely-sized steering wheel with red stitching and GT logo, and the very decent sound system. My phone connected by Bluetooth on the first attempt, the TFT instrument panel (meaning it’s a computer display) is cool, I found legroom and headroom surprisingly good in the back and the boot is a good size, with a hidden storage tray between it and the proper spare wheel beneath. 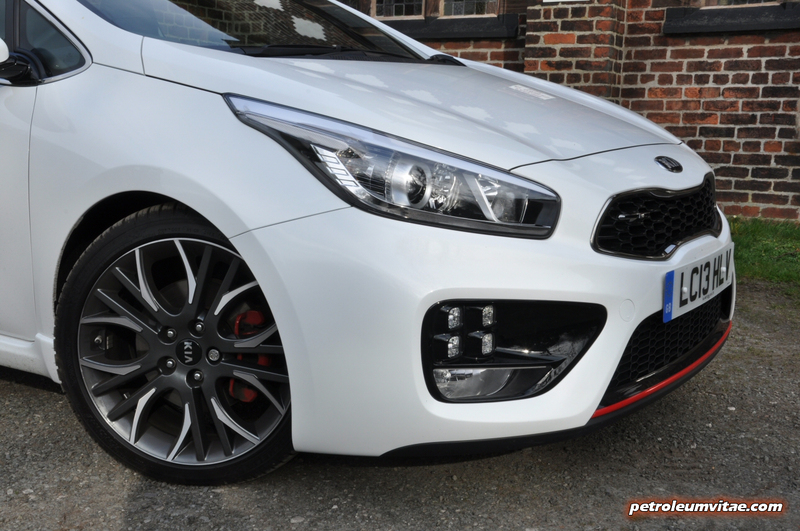 As I’ve explained, Kia aren’t actually aiming to pinch sales from under the noses of Renault, Ford, VW and the like, and in their press material they state their aim as producing a “performance car with everyday usability in civility in mind” – so does the pro_cee’d GT 3dr succeed? First things first, the 1.6-litre, turbocharged petrol T-GDi engine is very civilised and smooth, starting up with no drama at all. 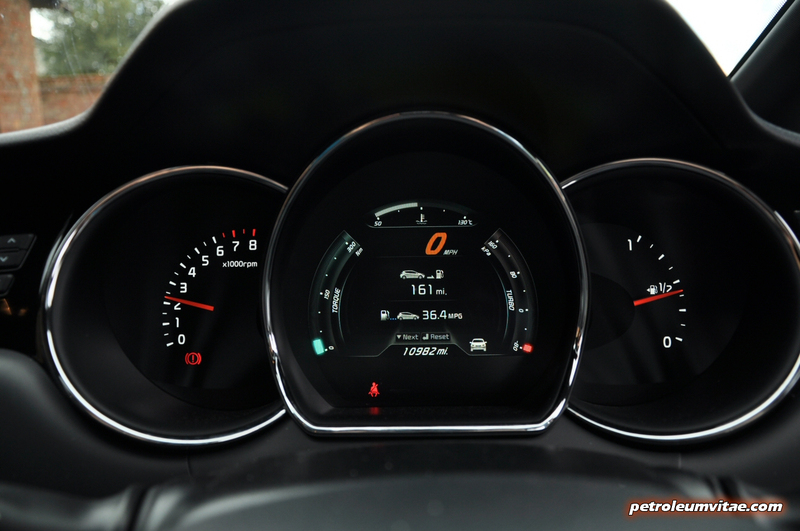 The gear ratios felt very nicely spread out and definitely geared (pun intended) towards sporty performance driving, and the shift action was just right, not at all notchy. 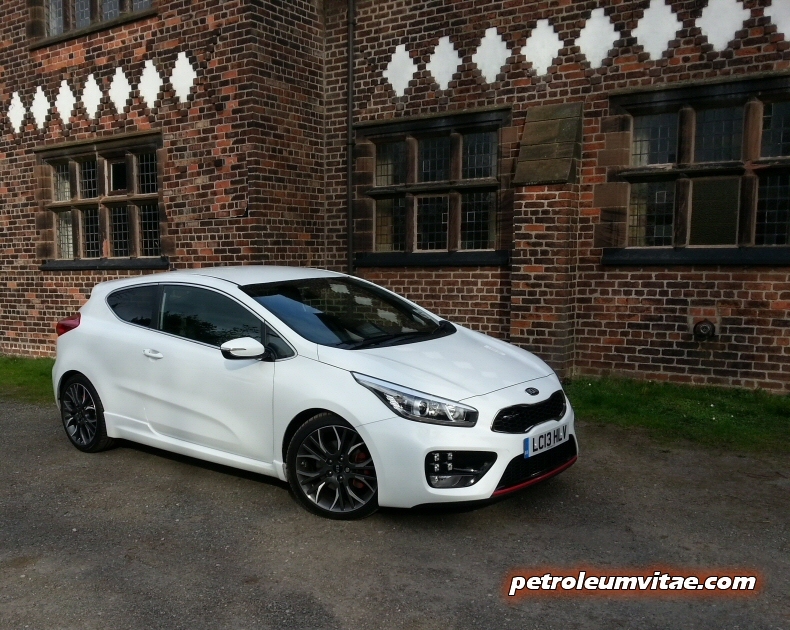 Not that I timed it, but the 7.4 seconds figure to hit 60mph felt realistic, as did its acclaimed top speed of 143mph, and although I couldn’t really hear any kind of sporty exhaust note from inside the cabin, the Kia certainly shifted briskly enough. It stopped well, too, so no complaints with the brakes. 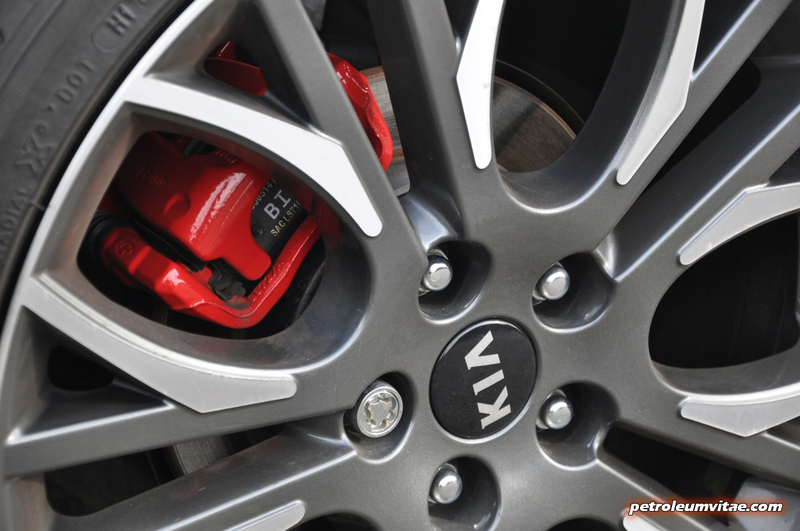 The engine instantly struck me as being pretty torquey from low down, right up into the mid-range, tallying with Kia’s stats of 265Nm from 1,750rpm upto 4,500rpm.Some engines are fussy but the pro_cee’d GT’s 1.6 T-GDi complied with whatever I asked of it and seemed to have plenty of urge in almost any gear. This meant that motorway driving was effortless, often being able to overtake without changing down a gear. 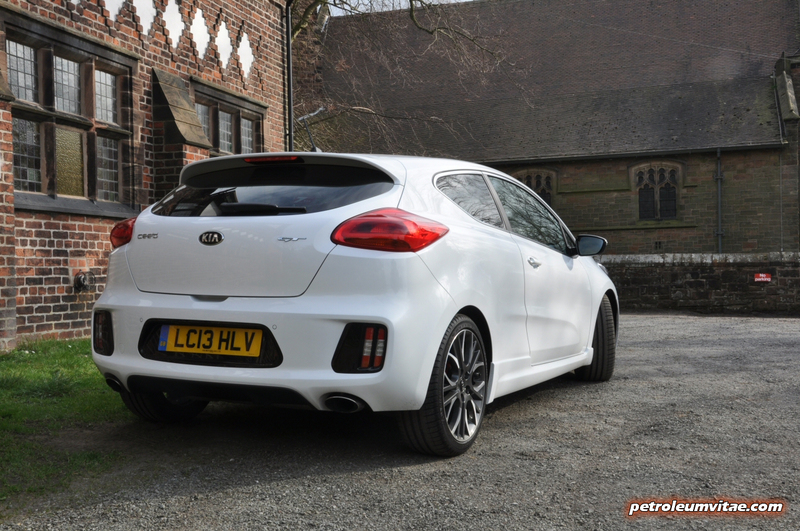 Around town, 4th gear or occasionally even 5th kept the Kia happy at 30mph and it certainly lived up to its ambitions to be a civilised performance hatchback. 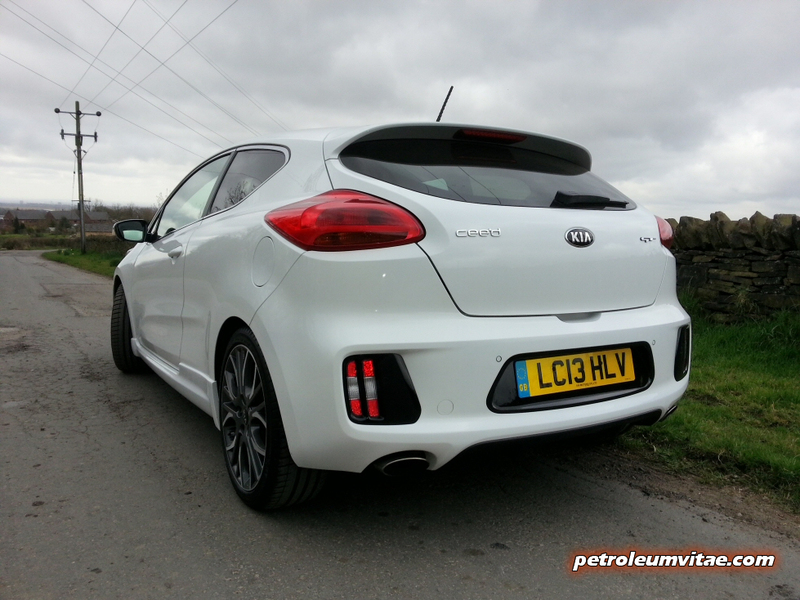 I could tell Kia have put a lot of time and effort into the suspension and steering setup, and although the ride was a little thuddy and hard at times, it made for a fun driving experience on twisty country lanes. 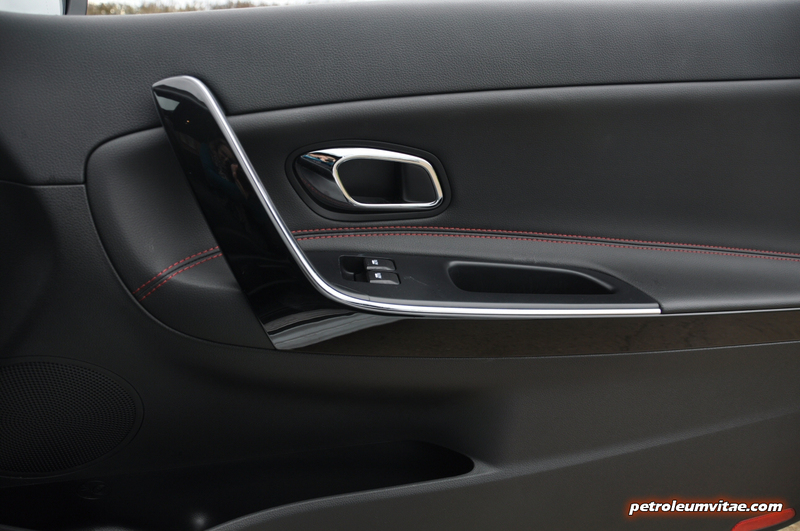 Granted, the feedback wasn’t quite as perfectly communicative as some much more expensive sports cars, but it still gave me a good idea of what the wheels were doing and was responsive enough to give me the feeling of being in control. 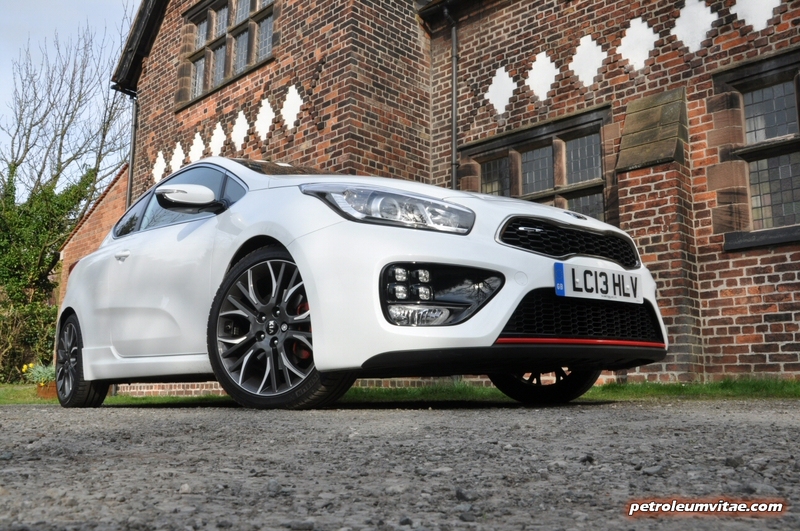 Most car buyers don’t have the circumstances or the courage to push a car to its absolute limits, which is really only possible on a track anyway, so in real-life terms I can certainly vouch for the Kia’s excellent handling at typical twisty B-road speeds. 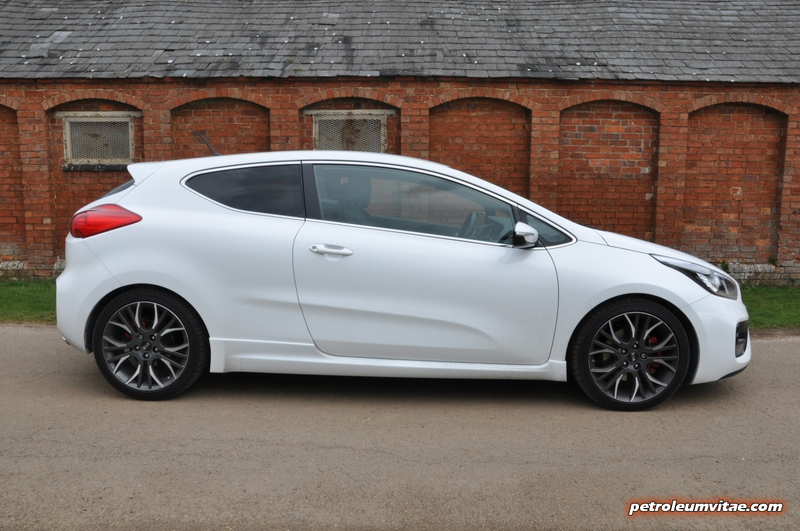 The 201bhp will be enough for buyers accustomed to more pedestrian hatchbacks with their middling engines, and the pro_cee’d GT’s steering is nice and neutral with a definite propensity towards slight understeer if you really push it. Overall, the Kia is definitely more of a picket line protest than an all-out riot, but that once again achieves what it sets out to do. The model I tested was a GT as opposed to ‘GT Tech’, so lacked sat nav, but did come stuffed with loads of goodies. 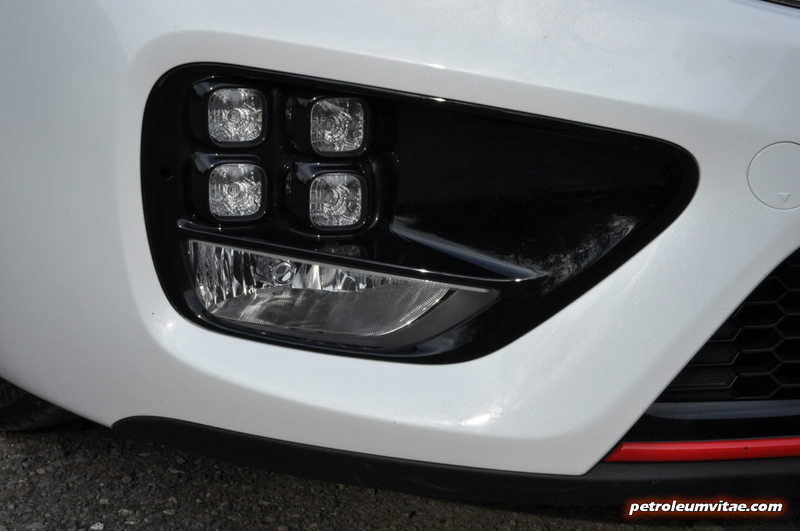 In addition to the features I mentioned earlier, it also benefitted from cruise control with a speed limiter, Hill-Start Assist, parking sensors and to my pleasant surprise, puddle lights and cornering lights. Also, in case you’ve not parked with the wheels straight, a nice little message comes up on the TFT display telling you so, which is rather handy. Manoeuvrability was generally good, with added help from the rear parking sensors, compensating for a slight lack of rear visibility which is common with many 3dr hatchbacks. As well as having a decent under-floor storage tray, the boot also came with a storage net, which proved very useful, stopping loose items rolling around. 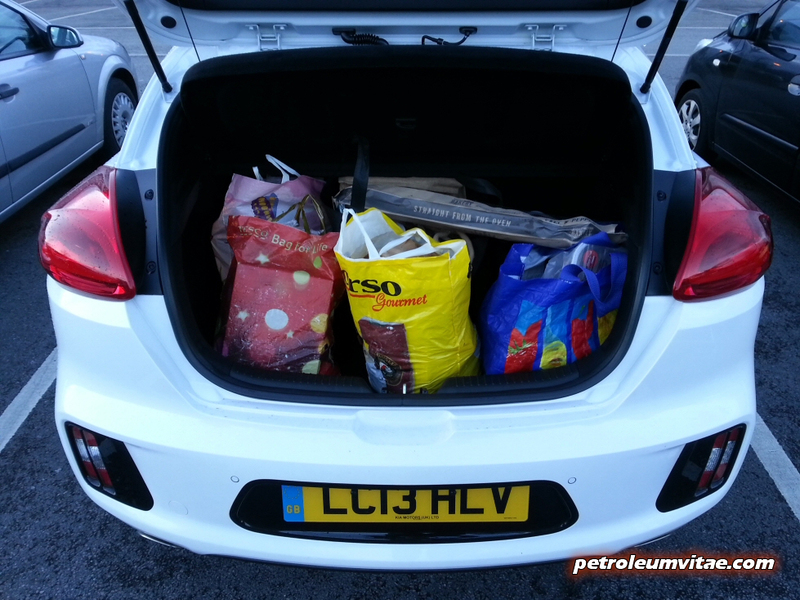 It’s the same size as the boot in a Golf or a Megane, and slightly larger than the boot in a Focus. The glovebox wasn’t the largest I’ve seen, but the plasticy central storage compartment is a good size, as are the door bins, and the seats have proper pockets on the back, which I always prefer to nets. 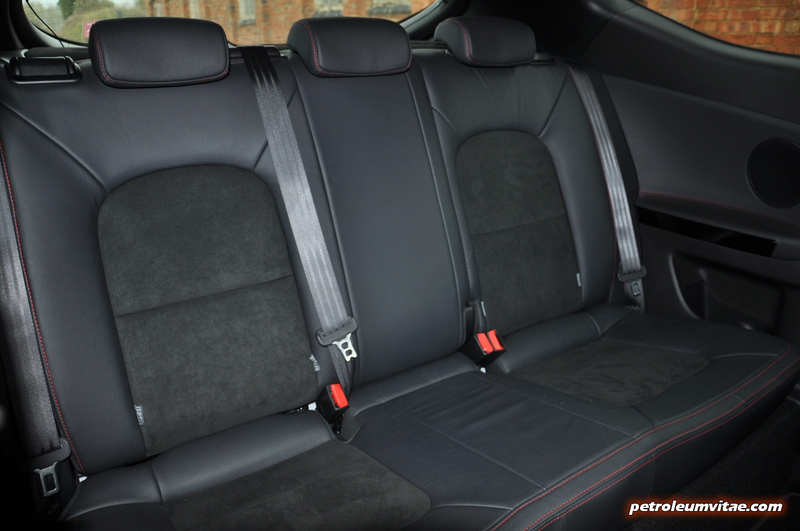 I can’t comment on child seats and only sat in the back for a short while, but there certainly seemed to be a good deal of all-round room in there, and the seats fold down 60:40. Oh, and for gadget-obsessed folk, the front of the car provides not one but two 12V sockets, plus a USB connection. In the environmental stakes, I averaged 34mpg during my week of realistic, mixed driving, compared to the published figure of 38mpg. 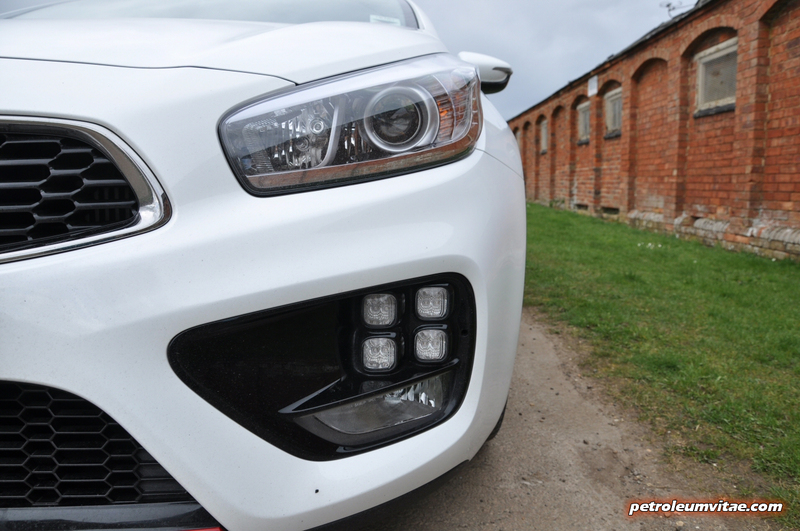 The Kia pro_cee’d GT emits a few CO2/km less than the Megane 265 and a smidgen more than the Focus, but none of them can beat the efficiency leader, the Golf GTI. 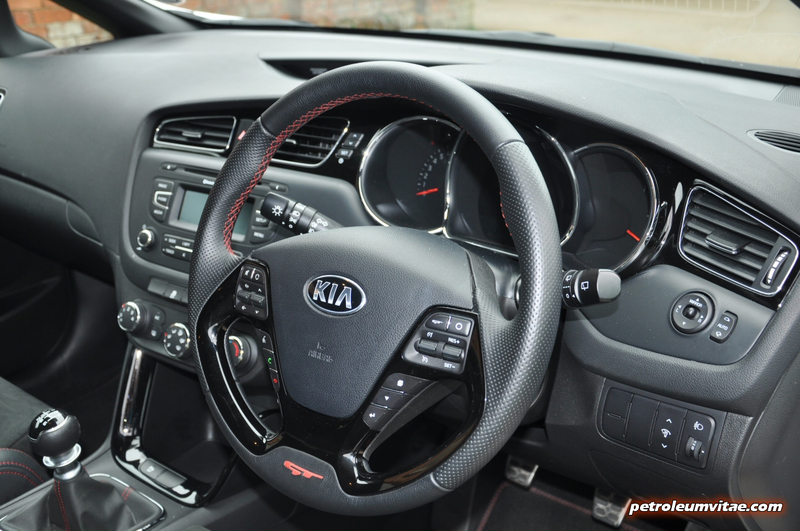 And on that note, no other car can match the Kia’s trump card, though – its astonishing 7-year warranty. Being someone who knows what French car reliability can be like and how expensive repairs to German cars can be, I’m seriously impressed by Kia’s legendary warranty offering, combined with the general, reassuring idea that Korean cars are usually very reliable and solid. 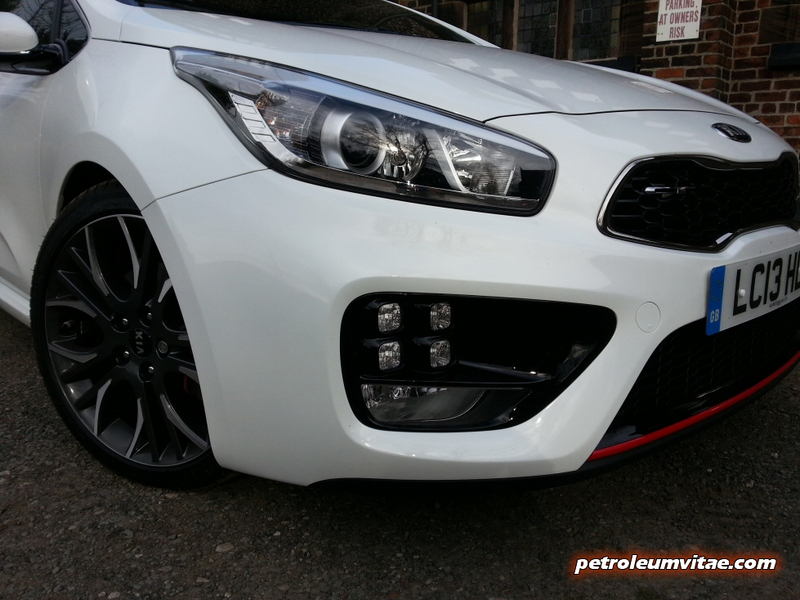 The Kia pro_cee’d GT isn’t fiery hot, but this wasn’t the Korean firm’s aim, so it certainly ticks their aspirational boxes when it comes to manageable, everyday performance. 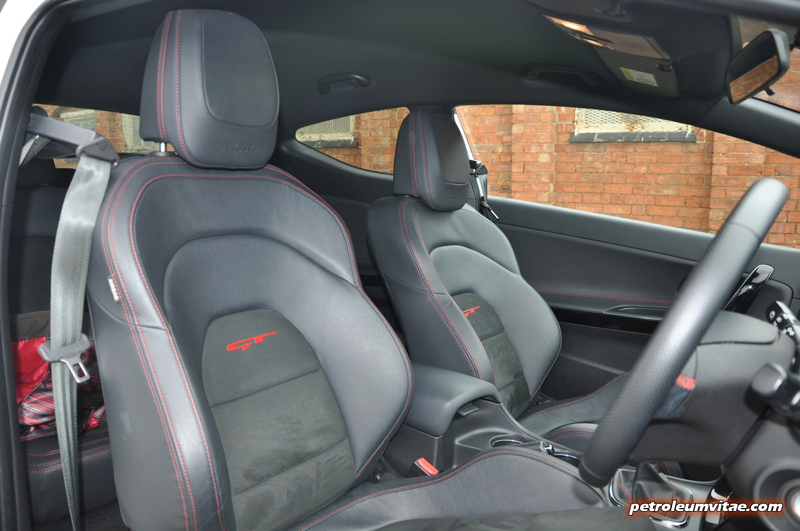 Give it a more audible exhaust note and the whole package may have been slightly more stimulating to the senses, but the 201bhp combined with its decent handling, well-judged gear ratios and decent servings of torque make this a very worthy performance hatchback to consider. 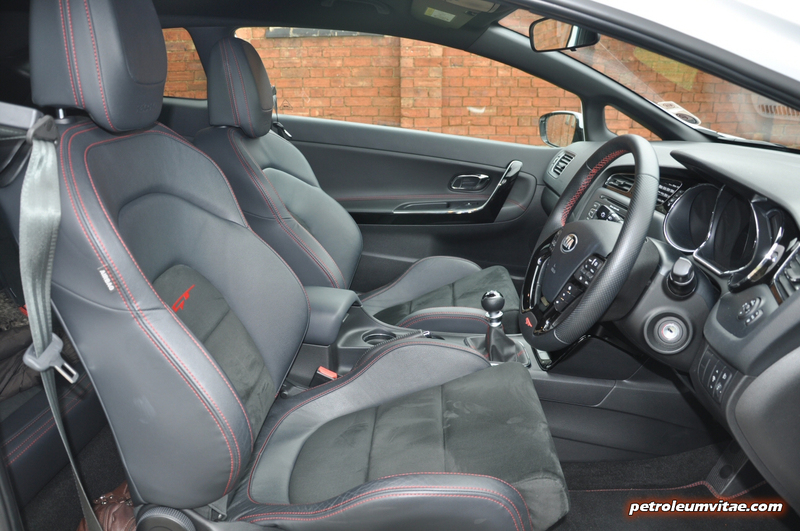 What’s more, it comes with that revered 7-year warranty, a very solid and feature-packed exterior and interior, and I reckon buying a pro_cee’d GT will give you the edge if you want to be discerningly different. I don’t think you’ll be disappointed.